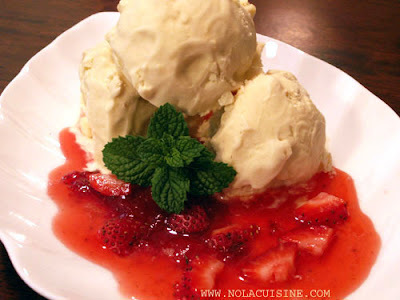 I admire that you concentrate on the “infrastructure” of the cuisine–how to make chaurice, how to make boudin, andouille–and now creole cream cheese and ice cream..
What’s more, is that there is SO much more to look forward to…. slaws, salads, greens, breads, biscuits, fritters, huch puppies, king cake, calas…. What a pleasure this site is. I can’t tell you how exicted I am to try this. When I was a kid we used to get Brown’s Velvet or K&B’s house brand whenever we’d visit my gran & gramps and it was HEAVEN. Now K&B’s gone, the grandfolks are gone, and nobody knows about cream cheese ice cream. Thank you for bringing it back! I love this site buddy!!!!!!!! Please keep all of the receipes coming!!!!!! It’s good to be from N’awlins!